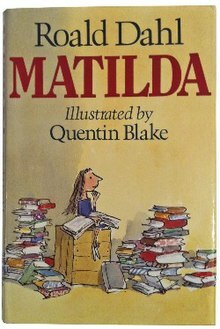 In 1988, when I had just turned eleven, my aunty gave me Matilda by Roald Dahl, about an extraordinary bright girl with dimwitted and unpleasant parents, who discovers she has the power to take on the nasty adults in her life. It became one of my favourite books of all time. Already an avid reader, the character Matilda inspired me to read even more and not having read any books by Roald Dahl before, I thought I had died and gone to heaven when I discovered all the other books he had written! When I had kids of my own many years later, I couldn’t wait to share Roald Dahl’s worlds and characters with them. At the time my kids were still too young to read (unlike Matilda) and I was thrilled when I discovered the audiobook of the exquisite Dutch translation by Huberte Vriesendorp. The book is narrated by Jan Meng, who does a brilliant job bringing the story to life, and my kids were hooked in no time as well. I’m afraid the CDs have been played so often that we’re one small scratch away from having to buy a new set. I had to read some of these books in my high school English class, but because I grew up in the Netherlands the focus was mostly on Dutch literature, and rightly so. I didn’t like being ‘forced’ to read and I must confess that I don’t remember much of what I read back then, as I didn’t read for enjoyment but for grades, cramming the night before the exams and forgetting most of it as soon as I laid down my pen. But now that nobody is the boss of me anymore, I can read these books out of my own free will, once again inspired by Roald Dahl and Matilda Wormwood. I have created a shelf on my Goodreads reader profile with all the books listed above and have kicked off with Great Expectations. I doubt I’ll be able to finish all of them in a time-span of six months or so, like Matilda did, but I’m going to try it anyway. The copyright on many of the books on the list has expired and they are available as free e-Books from Amazon and other e-book sites. Just Google ‘free e-books’ and discover what’s out there. Which books that you have read have made a lasting impression on you?